Email not displaying correctly? Pictures missing? View it in your browser. Our new list is available offering a wide variety of specimen marine, land and freshwater shells for sale. You can view the list without any membership sign-on obligation. Please contact us if you have questions about any of the specimens on the list. We hope you will enjoy this and future issues of Worldwide Shell Notes (WSN). A PDF version of WSN is available upon request. You can stop receiving future mailings at any time by clicking the "Opt-Out" link at the bottom of this page. In future issues we will keep list notifications limited to a link and a few pictures. As always, there is no cost for receiving WSN. When you arrive at the home page of worldwideconchology.com you can click on "Conchology - The Art & Science of Nature" or "Worldwide Specimen Shells". Conchology - The Art & Science of Nature is a non-commercial Web site created in 1995 that contains a large gallery of shell images and notes about the pictured species, all arranged taxonomically. The site has many other resources for conchologists including slide programs and integrated links on each family page to useful and related sites for the particular molluscan family -- but no shells are for sale here. Worldwide Specimen Shells, on the other hand, is a Web site for shell collectors who want to purchase quality marine and non-marine shells that will add scientific value and aesthetic beauty to their collections. Worldwide Specimen Shells was established in 1977. Visit the ordering instructions on the menu tab to familiarize yourself with the easy ordering process. Send us your want lists too. Enjoy visiting and perusing the shell offerings. Every-so-often I'm asked what is the correct taxonomic family for the species in the genus Colubraria?" My stock answer when questioned about taxonomic placement is, "It depends!" That is, it depends on whose classification you subscribe to. Colubraria has been seemingly moved around more times than a military career officer. In 2002 I participated in a discussion on Conch-L about the correct taxonomic placement of the genus Colubraria. Here is an updated synopsis of what I wrote. "... The classification of Colubraria Schumacher, 1817 has been in a perpetual state of flux, with differing opinions as to a taxonomic placement for the genus and related genera. Colubraria have been placed in the Cymatiidae (now Ranellidae), Fasciolariidae (Vaught, 1987), the Buccinidae (Beu & Maxwell, 1987) [Beu, A. G. & Maxwell, P. A., 1987. Revision: Fossil and Living gastropods related to Plesiotriton: Appendix: Genera of Buccinidae [Pisaniinae] related to Colubraria Schumacher, 1817 N.Z. Geo. Surv. Paleo. Bull. 54:16-58. ], and elevated to a distinct and seemingly homogeneous family Colubrariidae Dall, 1904. Kilburn (Sea Shells of Southern Africa, 1982, p.95) uses the Family Colubrariidae and writes, "The Colubrariidae is a problematic group, once referred to the Cymatiidae and now sometimes synonymized with Buccinidae. It evidently differs from the latter in details of the digestive system. ..."
In a random search of recent molluscan literature many important geographical monographs subsequent to Beu and Maxwell's 1987 paper classify the Colubraria either in Fasciolariidae (presumably based on Vaught), or Buccinidae, with only a few still retaining the Family Colubrariidae. In the years prior to 1987, publications of similar scope use either Colubrariidae, Cymatiidae, or Buccinidae to classify the Colubraria. Yet another taxonomic conundrum. Highly respected taxonomic Web resources such as Malacolog, a database of Western Atlantic gastropods and the OBIS Indo-Pacific Molluscan Database classify the genus Colubraria in the Family Buccinidae, along with the related Colubrariid genera Minibraria, Monostiolum, and Tritonoharpa. Alternatively, many shell dealer Web sites now classify the Colubraria in the Family Colubrariidae Dall, 1904, probably following Bouchet and Rocroi (2005); [Bouchet P. & Rocroi J.-P. (Ed. ); Fr�da J., Hausdorf B., Ponder W., Valdes A. & War�n A. 2005. Classification and nomenclator of gastropod families. Malacologia: International Journal of Malacology, 47(1-2). ConchBooks: Hackenheim, Germany. ISBN 3-925919-72-4. Issn = 0076-2997. 397 pp.]" Penultimate Whorl: The last spire whorl before the body whorl; penultimate meaning "next to the last". Peristome: The expanded or thickened lip that surrounds the aperture of a helical shaped shell. It is a term more commonly used to describe the expanded portion of a land shell lip. Polyplacophora: A primative class of mollusk commonly known as Chitons that have eight shelly plates surrounded by a fleshy girdle. There are more than 900 living species of Chitons found in all oceans of the world from shallow water down to extreme depths. Protoconch: The first or embryonic whorl of a gastropod shell. The protoconch is very often an important aspect in confirming the identification of closely related gastropod species. Art & Science of Nature - Understanding the Beauty of the Natural World. A new Blog for shell collectors and anyone interested in the beauty of the natural world. Art & Science of Nature (ASN) aims to bring together in one Blog the most beautiful and fascinating aspects of the natural world using the foundations of science and sociology to enable a better understanding and appreciation of nature. The Phylum Mollusca is the main focus of ASN, but is only one of many earthy topics to be explored. Opt-Out: Remove me from future mailings. Copyright © 1977-2009 | Worldwide Specimen Shells & worldwideconchology.com | All rights reserved. No contents of this publication may be used or reproduced without the express written consent of the publisher. The only illustration that exactly matches the yellow and pink shells. Shells with a more ovate shape than the original lot. Images of shells very much unlike the original yellow and pink shells. The illustration first used to place the name festiva on the yellow and pink shells. One of the shells from the original lot. the Hidalgo and Pilsbry illustrations. Very similar to C. festiva, but smaller in size and with a more variegated cuticle pattern. A few of an infinite number of pattern varieties of the cuticle. OBSTICLES IN IDENTIFICATION: Land shell identification usually involves a mix of literature searches, knowledge of local molluscan faunas, and in a few extreme cases, voodoo! The greatest obsticle to correctly identify a land shell is the lack of readily available literature. It's a case of feast or famine. Some terrestrial groups are well documented. Others are barely covered in print. Access to obscure scientific journals and monographs are essential to narrow down the possibilities. Add to this the unreliability of locality data of some species of commercially available land shells and the task of identification becomes daunting. Land shells often have limited locality ranges and verifiable data can help narrow down the possibilities. RECENT HISTORY: In 2002 a magnificient Helicostylid species, became available on the commercial shell market; a shell that was not familiar to recent collectors and shell dealers. The brilliant yellow color, pink-tipped spire and stunning pink peristome was unlike any land shell seen in recent memory. After obtaining a few specimens (Fig. 5) and having been approached by a couple of fellow dealers with the question, "what is this? ", I began an intensive literature search in my library to find a name for this species. Helicostylids are a large group of tropical pulmonate land shells in the Family Bradybaenidae. The group is found from the extreme northern Philippines south through northern Indonesia. The only thing I was able to conclude, based on my knowledge of the Helicostylids, was that the locality data supplied with the original shells (Surigao, Mindanao Island) was incorrect. This species has nothing at all to do with the Mindanao Helicostylids. Its shape and form is very closely related to the Calocochlia pulcherrima complex found on Luzon Island. The Luzon Helicostylid fauna is quite distinct from other Helicostylids found through the Philippines Archipelago. 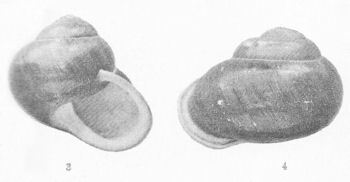 ESSENTIAL LITERATURE:The main sources for identification of this species were Hidalgo (1891), Faustino (1930), Mollendorff (1898), and Pilsbry (1891) plus a number of well-documented collections of Philippines land shells. The one literature reference that I lacked was Kobelt (1905), a massive publication covering all of the then known land shells of the Philippines. IDENTIFICATION: In brief, the closest I could come to a name was Calocochlia festiva (Donovan, 1825), a red species with a pink lip of the same general shape and form as the newly discovered species. A brownish-yellow form is mentioned in Hidalgo, but Hidalgo's black and white illustration was not conclusive. 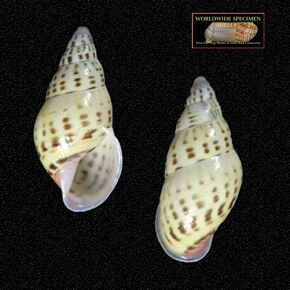 Tropical land shells tend to vary in color so it was not a stretch to believe a yellow form would exist. The yellow and pink shells also lacked cuticle (periostracum). The cuticle patterns are distinct in each species. I could not determine whether these shells ever had cuticle in nature. They looked overly cleaned, which would remove any external covering. Strike one for additional additional characteristics that would help narrow down the possibe candidate species. C. festiva has only been recorded from Cayagan Province, northern Luzon Island, Philippines. Without any definitive data the identification would have to be based solely on morphological characteristics of the shell. Strike two. The closest species were all part of the Calocochlia pulcherrima complex. They include C. dubiosa, which is a much smaller species and quite a bit dissimilar. Calocochlia pulcherrima has a brown shell with a variegated white cuticle. It is also generally smaller in size that the others in the complex. The illustrations of C. chrysochila in Pilsbry and Hidalgo show a species with a higher spire and white to tinted color peristome; the shape nothing like the yellow and pink shells on hand. The illustration of C. festiva in Hidalgo (Fig. 4) and Pilsbry of supported my initial investigation that the species in question was Calocochlia festiva -- pink lip, and similar shape and size. I concluded that the form of C. festiva described with a pink peristome color and a yellowish-brown body whorl was the best match for the species in question. Additional research and comparison with private and museum collections did not reveal a better identification. THE OUTCOME: After sharing this information with a few fellow collectors and dealers, the name Calocochlia festiva and the locality data mentioned in the literature, Cayagan Province, spread like wildfire. Strike three! Within a couple of months the name appeared on price lists and the Internet as the defacto identification for this yellow and pink shell. At no time did I consider the identfication definitive, only the best available name given the circumstances; that is until now. NO MORE SPECULATION: Fast forward to May 2009. I recently obtained a copy of Kobelt's monumental and rare publication on Philippines land shells. Pictured clearly on plate 23 of Volume 10 was an illustration of the bright yellow Helicostylid shell with pink peristome (Fig. 1). I no longer have any doubt as to its identification. The yellow and pink shell in question for so many years can now be confirmed as Calocochlia chrysochila (Sowerby, 1841). The species has been recorded from Cagayan Province, northern Luzon Island, Philippines and the off shore island of Calayan. C. chrysochila seems to inhabit the same geographical range of C. festiva. Both are "very" closely related. Interestingly, two forms of Calocochlia chrysochila exist; a larger form with a lower spire and broader reflected peristome (Fig. 5), and a smaller more ovate shell that I received a couple of years after the first lot (Fig. 6). 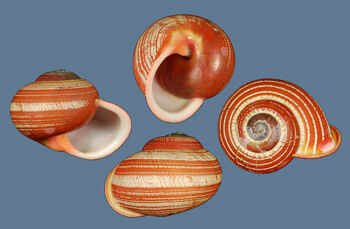 This smaller form is very similar to the shells illustrated in Hidalgo (Fig. 3) and Pilsbry (Fig. 2). Unlike its closest relatives, C. pulcherrima (Fig. 7) and C. festiva (Fig. 8), C. chrysochila does not seem to have a natural cuticle according to Pilsbry (1891). None of the specimens I have seen have any trace cuticle. I assumed the lack of cuticle was due to judicious cleaning, or being dead-taken specimen, as are so many of these shells. This does not seem to be the case. It would also be interesting to know whether the two seemingly distinct forms are found together or in separate populations. If I had the smaller, higher spired specimens earlier on, I might have been less convinced that the yellow and pink shells were C. festiva. But that is all part of the challenge when identifying land shells; the mix of available material, reliable documentation and the literature on hand. 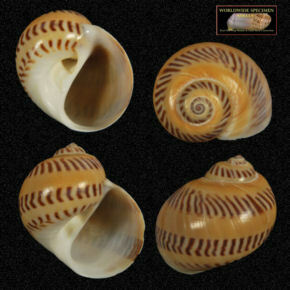 The hunt for correct identifications of tropical land shell species can be made easier if more accurate documentation is provided, and if the shells are kept with its natural exterior ornamentation such as periostracum or cuticle (Fig. 9). Until then, poorly known land shells will make nice display pieces in our collections, but with less scientific value. That may not be a bad thing, but the situation can certainly be better. Faustino, L. A. 1930. Summary of Philippine land shells. Philipp. J. Sci. 42: 85-198. Hidalgo, J. G. 1891-1901. Obras malacol�gicas. Parte I. Estudios preliminares sobre la fauna malacol�gica de las Islas Filipinas. Atlas. - Memorias de la Real Academia de Ciencias Exactas, F�sicas y Naturales de Madrid 14: p. , L�m. A-C, I-CLXX [= 1-170]. Madrid. Kobelt, W. 1905 Reisen im Archipel der Philippinen von Dr. C. Semper. Wissenschaftliche Resultate Bd. 10; Landmollusken Erg�nzungen und Berichtigungen zum III. Bande, Die Landmollusken / von O.F. von M�llendorf, Wilhelm Kobelt und Gertrud Winter. Pilsbry, H. A. 1901-1902. Manual of Conchology. Ser. 2. Pulmonata. Academy of Natural Sciences of Philadelphia. (1891) Vol. 7.